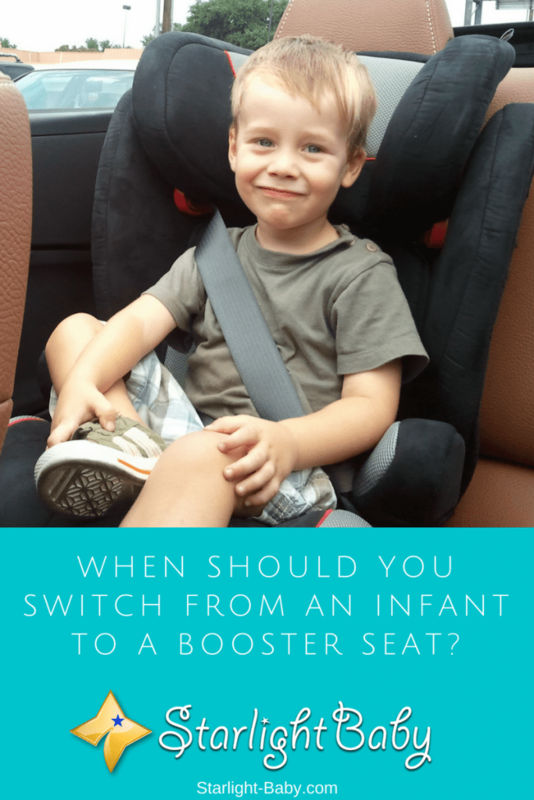 When Should You Switch From An Infant To A Booster Seat? For many parents, knowing when it’s time to make the switch from using an infant to a booster seat can be difficult. There’s a lot to consider, and it’s a common misconception that you just need to go on your child’s age and height alone. The fact that different states have slightly differing rules on car booster seats also makes it a lot more complicated. Take Florida, Arizona, and South Dakota for example. They are the only three states which don’t legally need parents to have a booster seat for children who outgrow their safety seats. So, it’s important to check the rules in your specific state before choosing any type of child car seat. So, how can you tell when it’s time for your little one to transition into a booster seat? Below you’ll discover everything you need to know. 1. Is my child capable of sitting still while I’m driving? 2. Will they keep the seat belt on? 3. Can they use a seat belt correctly? If you answer yes to each of these questions, it’s a good indicator that your little one is mature enough to switch to a booster seat. It’s important to ensure that your child is mature enough to make the switch, rather than just fitting the general age, height and weight restrictions. As a general rule, no children under the age of four years old should be placed into a booster seat. However, you know your child and some won’t be mature enough at the age of four to handle the freedom that comes from a booster seat. What If They Aren’t Mature Enough? So, what happens if your child has physically outgrown their infant seat, but they aren’t yet mature enough for a booster seat? Well, the good news is that there are alternatives available. Combination seats are a fantastic option. They can be used from birth, right through until your child is 12. These allow you to keep your little one in a rear facing position for as long as it’s needed. There’s also forward facing seats which can be used from 9 months until the child is 12 years old. So, a booster seat isn’t the only step up you can make. There’s a lot of different car seats on the market, though you do need to make sure you’re choosing the right one for your child’s age, height, weight and one which matches the model of your car. If you feel your child is ready for a booster seat, the next thing to think about is the type of booster seat to invest in. There are two main types – the high-backed booster and the backless. So, what’s the difference between the two and which one should you be using? High Backed Booster Or Backless Booster – Which One Should You Use? If you’re trying to decide which type of booster seat to invest in, it’s a good idea to understand the pros and cons of each option. Backless Booster Seats – When you hear people recommending booster seats, or think about purchasing your own booster seat, typically it’s the backless models which come to mind. These are small, portable plastic boxes, which are roughly the same size as a cushion. Backless seats are designed to raise your child up enough for the adult seatbelt to safely fit across them. They are advertised as being ideal for children aged 4-12 years old. However, some experts are arguing that these types of boosters don’t provide enough protection in the event of an accident. In particular, they don’t really protect the child in the event of a side-on crash. So, if they don’t provide as much protection, why would you consider them at all? Well, mostly these types of booster seats are popular because they’re the most affordable type available. They are also more convenient than the high-backed varieties, particularly if you’re using them in a second car, or as an occasional go-to in a friend or family member’s car. High-Backed Booster Seats – These types of booster seats are considered the safest and most reliable. As well as the seat itself, they also contain protection at the sides and a headrest for additional comfort. They’re designed to be used by ages 4-12. Some also come with a detachable back, so you won’t need to worry about carrying them around. Another thing that can potentially put you off buying this type of booster seat is the cost. Compared to the backless models they do tend to be a lot more expensive. However, considering the amount of time your child will use it for (potentially 8 years), it does provide excellent value for money. The additional safety also makes the cost more than worthwhile. Overall, knowing when to switch from an infant to a booster seat isn’t always easy. The above advice should help, but also pay attention to manufacturer guidelines. Each seat comes with its own instructions which should always be followed precisely. Making sure your child is mature enough to use a booster seat should be one of your main considerations. I am reading this article at the right time. My baby is almost 5 months. Until now we place him on our laps when we are driving. When I am driving, the baby will be on his mother’s lap and when the wife is driving the baby will be on his father’s lap. We will not have him sit on the seat or even use a booster seat until he can sit properly. I think it is too dangerous to let him sit on infant booster seat. Perhaps, we will not use a baby seat until our dear son is at least one year old. Putting your baby on your lap while travelling seems more dangerous to me than putting him in a car seat. In the U.S., there are laws regarding the use of car seats for babies/toddlers. I guess it’s not that strict in your country if you’re able to do that. If you do decide to get a car seat for him, I’m sure there will be plenty to choose from.